Punch holes slightly larger than the rivet being set. 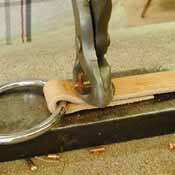 Place rivet, post up, through both holes in the leather. 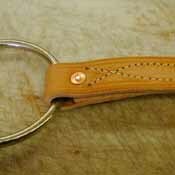 Place burr on the rivet. 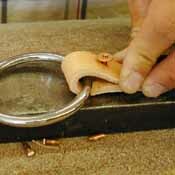 Use the rivet setting tool's straight hole to drive the burr down tight against the material. 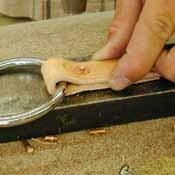 Cut the rivet off close to the burr with nippers (hoof nippers work fine for this). 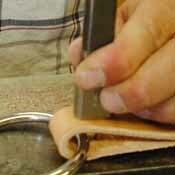 Do not cut off flush with the burr, but leave about 1/16 of an inch above the burr. 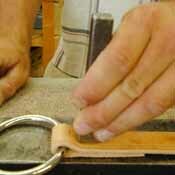 Place the concave recess of the setter on the burr. 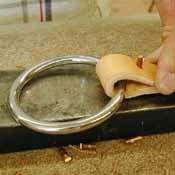 Hold perpendicular and strike the tool forcefully, turning to the left then right as you strike. 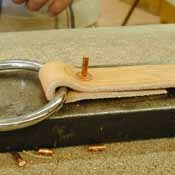 This spreads the end of the rivet over the burr, simultaneously rounding its end. 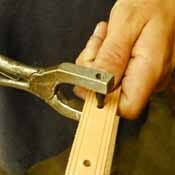 A few extra blows from the soft faced mallet can be used to flatten the rivet end a bit if desired.